April has been here for little more than 24 hours and the weather is already getting warmer in our neck of the woods. I haven’t been doing my monthly calendar’s and, to tell the truth, the only one who misses them is my Pop. Pop was hanging them in his office but now he has the Cats of the CB calendar on his desk. TW made a special request that I do one this month since the official condo calendar expired March 31 and they won’t have a new one until next Saturday. I usually don’t do what TW wants but decided to grant her this one request. You owe me big-time now, TW! Now where’s my green ball? Click on the image to biggify and print out. CK you are doomed. Congrats on winning the planner from Cody @ Cat Chat, so your person will never forget another vet visit. 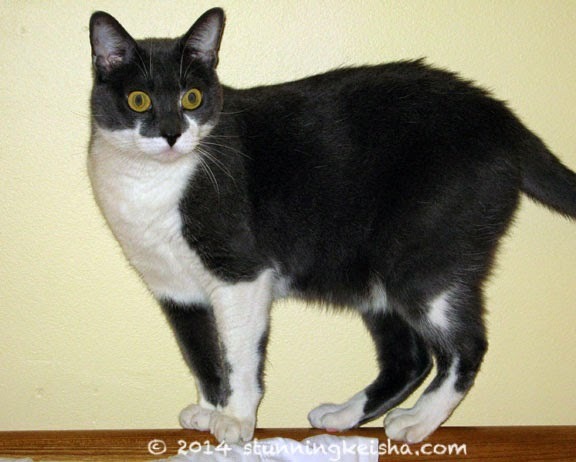 Socks has offered to share his ninja skills with you so your person while knowing it is the day take you to the vet won't be able to find you. It's the only thing we can do to save you, unless of course the postperson loses the planner in the mail. Glad it is warmer in your neck of the woods. We like your Easter themed April monthly calendar. Nice! I like your calendars, CK! I used to do them for my newsletter readers, but my human got tired of doing them every month (they are a lot of work and only got a handful of downloads). If we could do them faster (my human has to be fancy and use InDesign), we'd go back to them. CK..you are a beauty whether here or on a calendar page. Love and kisses. Idk if you saw it or not, so there it is! Spot on for Easter CK and glad it is warming up your way. You are looking mighty Easter bunny fine CK! Beautiful photos of you, CK! You sure were nice to grant TW's request! Glad your weather is turning milder for sure. I am so happy you are getting a little warmth up there! Your calendar for April is just adorable. And a STUNNING calendar it is!!! Sure glad you're enjoying spring. We're supposed to be getting a "wintery mix" later tonight and tomorrow. Somehow I don't think that's quite the same as "party mix." CK you are looking absolutely stunning. We keep hoping summer is coming, but more winter is headed our way instead. oh wow! Such a cool calender!!! It is actually finally starting to warm up a wee bit here as well. We still have our snow though, probably not for much longer. Aw, that's a great calendar photo! :) I make a calendar every year and give it to my folks for Christmas. I love your calendar, CK! Now Truffles is after me to make one for her! 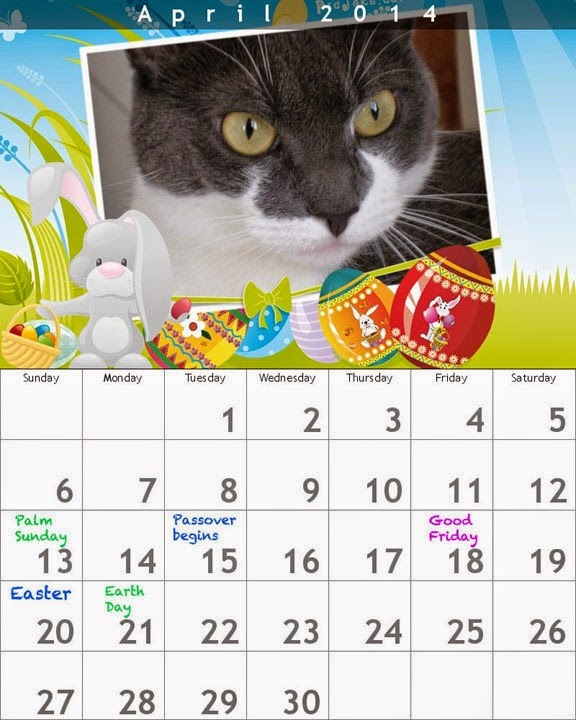 You make one pawsome calendar model! What a cheerful, springtime calendar! You're quite the calendar girl, CK. That is a lovely photo of you CK. I like your calendar too. My mum used to make calendars of me and Eric every year, but this year she went out and bought them. Nice Easter-y photo CK! So did you get your paws on that green ball after you granted TK's wish????? HMMMMM???? Ohhhh...April looks great through your eyes CK! Luvluvluv your calendar art. It may be getting warmer by you, but we got snow! It's bending the branches of the trees in our yard. I guess I shouldn't complain. We didn't get much snow all winter, so it had to show up sooner or later. You are a great model cat, CK! You make that calendar fun to look at! Looking good Miss April. I think we finally can say good-bye to winter! Beautiful! Your Daddy has great taste!